After Mahmoud Darwish's death in 2008, his friend Breyten Breytenbach was inspired to create this collection of poems honoring him. There is much fertile common ground the two poets share: a guiding empathy, an uncompromising commitment to truth and humanity, a language and dreamscape rooted in love and hope. 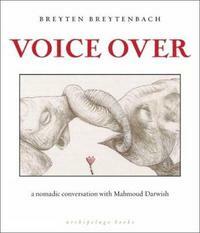 Voice Over is Breytenbach's passionate and elegiac exploration 'to look for Darwish among the words'. An outspoken human rights activist, Breyten Breytenbach is a poet, painter, memoirist, essayist and novelist. His paintings and drawings have been exhibited around the world. Born in South Africa, he emigrated to Paris in the late '60s and became deeply involved in the anti-Apartheid movement. Author of Mouroir, A Season in Paradise, The True Confessions of an Albino Terrorist, Dog Heart, The Memory of Birds in Times of Revo- lution, A Veil of Footsteps, among many others, Breytenbach received the Alan Paton Award for Return to Paradise in 1994 and the prestigious Hertzog Prize for Poetry for Papierblom in 1999 and for Die Windvanger (Windcatcher) in 2008.